As it Happens speaks with Bill Richardson — former Governor of New Mexico and former U.S. ambassador to the United Nations — about tensions between North Korea and the United States. On Monday, Mike Pence stood in the Demilitarized Zone and peered into North Korea. The U.S. Vice President is currently on a 10-day trip in Asia. Speaking on Monday, Pence referred to recent strikes ordered by President Donald Trump in Syria and Afghanistan and said "North Korea would do well not to test his resolve." 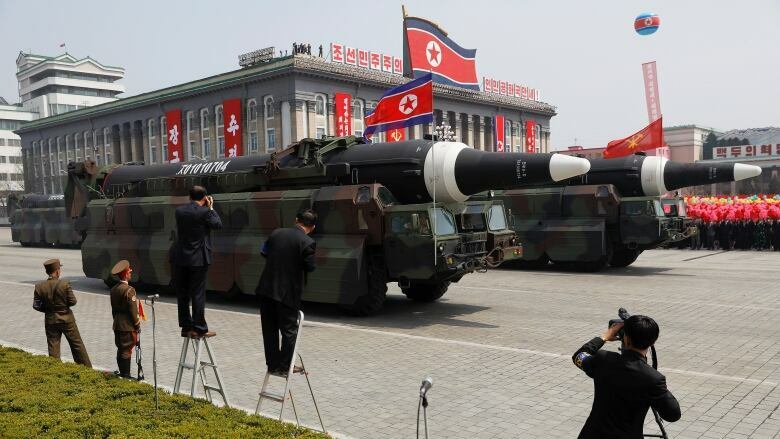 Just two days earlier, North Korea hosted a huge military parade featuring dozens of missiles. The day after, the country held a failed missile test. Bill Richardson has researched North Korea extensively and negotiated with the country. He's the former Governor of New Mexico and former U.S. ambassador to the United Nations. 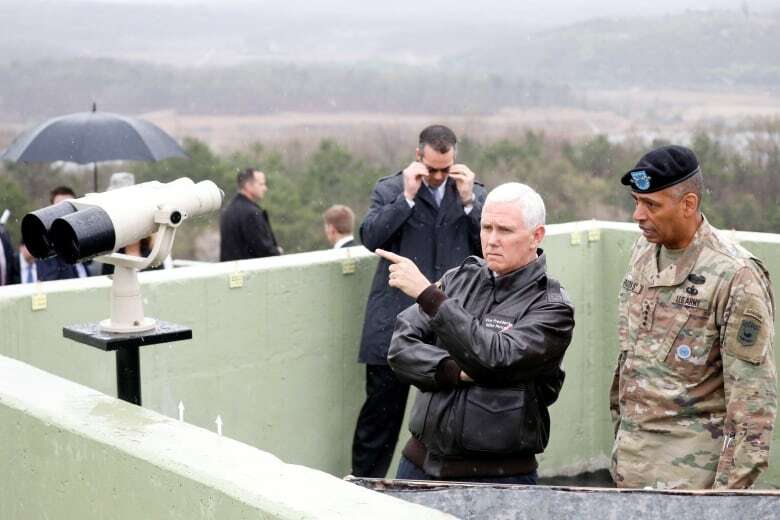 CAROL OFF: Mr. Richardson, what did you make of Vice President Mike Pence's appearance at the Demilitarized Zone between North and South Korea? In this Jan. 6, 2016 file photo, former Energy Secretary and New Mexico Gov. Bill Richardson poses in his office in Santa Fe, N.M. (AP Photo/Susan Montoya Bryan, File)BILL RICHARDSON: Well, I think it was the right message — sending a message to North Korea ... no more provocations, that the U.S. is going to respond. But, at the same time, I think the next policy of the United States should be to just cool it — let things lie. The North Koreans suffered a setback with the bomb falling apart. Let's let tempers cool down. The Chinese are pressuring the North Koreans for the first time. So, my advice — which won't be taken by the Trump administration — is to just cool it. Cool the rhetoric. Let the situation evolve so that the Chinese have time and inclination to pressure the North Koreans to stop some of their agitating and their ruthless behaviour. 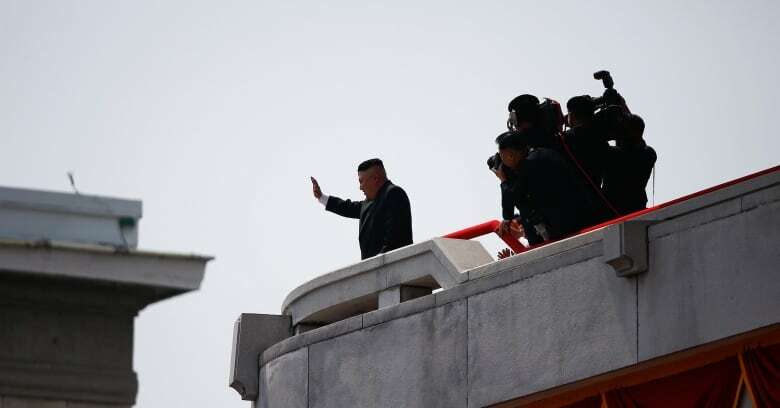 North Korean leader Kim Jong Un waves to people attending a military parade marking the 105th birth anniversary of country's founding father Kim Il Sung in Pyongyang, April 15, 2017. (REUTERS/Damir Sagolj )CO: You mention the bomb, just so people can remember, this is the ballistic missile that fell apart on launch yesterday ... Getting back to the language, you say you think they should "cool the rhetoric." Well, it doesn't seem like that's what's happening. Vice President Pence said, "The era of strategic patience is over," with North Korea. That, "All options are on the table." And, "We want to see North Korea abandon its reckless path." He said, "Either China will deal with this problem or the United States ... will." Does that sound like "cooler rhetoric" to you? BR: Well, I think he said it. It's done. I'm supportive of him saying that. I'm supportive of the warnings that we'd made ... I just know the North Koreans. I've negotiated with them. They're easily agitated. Kim Jong-un, the North Koreans suffered a big setback. You don't want them to overreact ... All I'm saying is, let's talk now about letting the Chinese exercise their pressure. Cool the rhetoric down a bit. Stop talking about pre-emptive strikes. That would be, in my judgment, a disaster. But, at the same time, you have to stand firm with the North Koreans. The only thing I'm saying is, let there be a cooling of tempers. Let's figure out a diplomatic, long-range strategy to deal with this problem. Reiterates American support of South Korea to reporters in Seoul 0:44CO: But, hasn't that been something that you and others have been doing for many years without much success? BR: Well, strategic patience. You know, I wasn't in the Obama administration. I worked in the Clinton administration. We had a deal with the North Koreans — curb their nuclear weapons and in exchange they'll get food, fuel, assistance of some kind, sanctions relief. That worked for a while. It fell apart. There's a new policy which involves a partnership between the U.S. and China. That makes sense. But, dealing with the North Koreans, you never know where they're heading. You don't know what they want. Kim Jong-un talks to nobody. He's isolated. He's unpredictable. But, they've also got 20 nuclear weapons, they've got ballistic missiles, they're dangerous. So, cool heads need to prevail. That's called diplomacy. CO: You dealt with Kim Jong-un's father. You mentioned this young leader is somebody that seems isolated and no one really knows how to talk to him. Do you really think that China has that much influence — that it has the leverage that Mr. Trump and Mr. Pence are saying that it should use? BR: Well, China has the leverage. They provide a lot of economic assistance, humanitarian aid, food, energy assistance. The issue is, are they going to use it. In the past, they've said they would. They haven't. But now, they seem to have an incentive from the United States. They won't be listed as a currency manipulator, [there] may be some trade benefits. But, also, I don't think China wants that instability — that tense atmosphere in the region. I think every power there wants regional stability. Nobody wants a war to break out because there could be a huge flow of refugees from North Korea, they would go to China. So, stability needs to be the key ... And there aren't any good options here. There is no good answer. Let tempers cool. Let's develop a diplomatic strategy with China, with South Korea, with Japan, with our allies, with Nato, with Canada. Canada can participate in humanitarian aid. You have a political prisoner — a Canadian — who's in North Korea. Let's find ways to get those prisoners out. Get the American, Otto Warmbier, out. Get the Canadian who's in North Korea out, as a path forward that leads to diplomatic negotiations. That's all I'm saying. This interview has been edited for length and clarity. 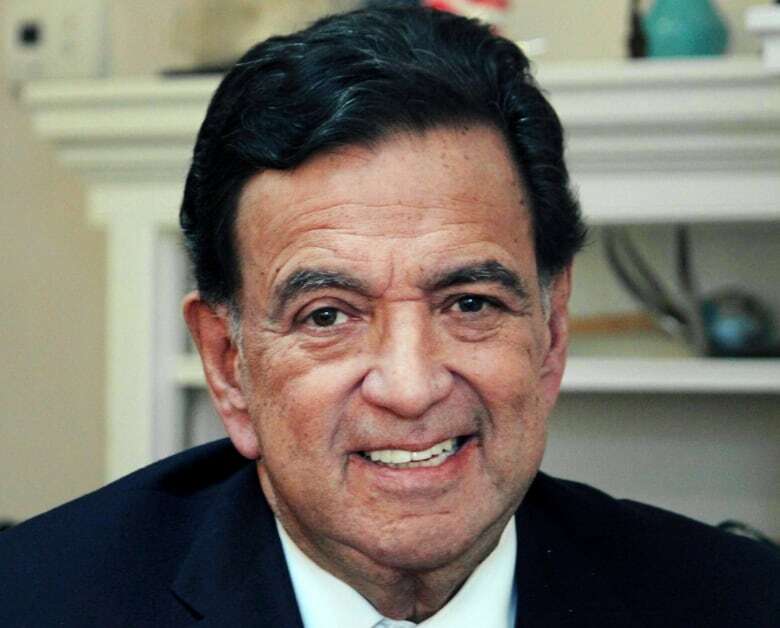 To hear more from Bill Richardson, listen to the full audio above.